Meredith is managing okay since she left her hometown of Crossroads, Montana—she’s working, paying the rent and putting food on the table for herself and her child, anyway. No matter how much time passes, though, she can’t let go of Pete, the only man she’s ever loved. Or the fact that her best friend is dead. How can I move on, Meredith asks herself again and again, when my sweet child is such a painful reminder? Her son is five when Meredith returns to Crossroads to claim The Serenade—a popular hotel, bar and restaurant—which she inherits from a dear friend who had treated her like family when her own family did not. She’s not sure if going home will really give her the fresh start she’s been looking for, or just reopen old wounds and resurrect old nightmares. Get your copy through Amazon TODAY! Download or purchase softcover of Crossroads Serenade TODAY! Amazon 5-star review by M.S. I do not often feel like I can pick up a book and feel as "at home" as I felt while reading this book. I enjoyed the comfort that the characters were able to give while the author built a thought provoking and dramatic story line. As a mother myself, Meredith's (the main character) interactions with her small child made me smile and also hit home with the worries and care she has to put into providing a positive life for her little one, while still searching for what is best for her own soul. Being a working mother with 2 boys in middle school, reading is my 'get away.' It's wonderful to read a book that sweeps me away and lets me get involved in another life and story. I enjoyed this book and all the nuances the writer included to make this book feel like I was delving into the life of a dear friend. 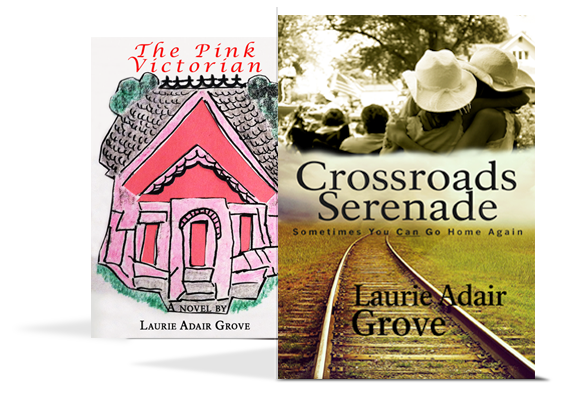 I look forward to more books written by Laurie Adair Grove! I just finished the book and I can truly say that I was sad to see it end. The characters are real and you easily become attached to them. The writting style is excellent because the story unfolds in such a natural way that it makes you feel as if an old friend is sitting at your table sharing coffee and a tale about her life. Crossroads Serenade is more than a romance novel, it is a story about an enduring love for a man and the many choices we have to make in life. It is also about the family we are born into and the family we choose to create that makes us who we are today. I would highly recommend this book to everyone. I like to read general fiction, contemporary romances, books that deal with family relationships, and coming-of-age stories. I also like some time travel books, mysteries and humorous stories, as well as American history, auto-biographies and biographies of all kinds of people. Now that the sequel to Crossroads Serenade is completed, I have started my next writing project! I grew up, the fourth of five children, with parents who loved nature and the great outdoors and had a healthy respect for books. We moved around the Northwestern USA, including Oregon, Washington, and Montana, which is probably why tall evergreens, majestic mountains and wide open spaces all make me feel at home. That life style fit right in with the way my husband, George, and I moved around when he was in the USMC. Eventually we settled in a rural area of western Oregon to raise our family, which is where I can often be found working on my next book! E-mail me at laurieadairgrove@gmail.com.